The KDC-10 is a tanker and transport aircraft which can rapidly deploy large numbers of cargo and troops over long distances. Besides, they can refuel other NATO aircraft like F-16 fighter jets and other aircraft equipped to be refueled by a boom system. 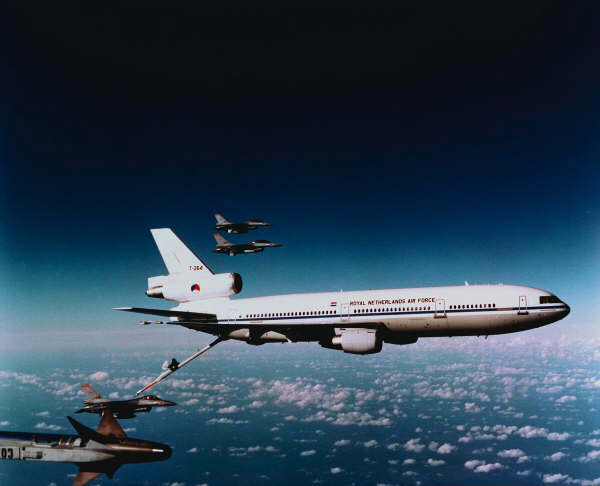 The KC-10A Extender from the United States Air Force seems like a Dutch KDC-10. A easy way to see the difference is that the KC-10 was derived from a cargo version and the KDC-10 from a commercial version, so the KC-10 has no windows while the KDC-0 has. Another difference is that the KC-10 has internal fuel tanks through which the KC-10 can give more fuel. On the other hand the KDC-10 has a larger transport capacity. The Royal Netherlands Air Force has 2 KDC-10 (tailnumber T235 and T264) and 1 DC-10 (which came operational in 2007 and will be withdrawn in 2014). The 2 KDC-10 aircraft were bought in june 1992 from the civil airliner Martinair (in those days they were designated with DC-10) and came operational in 1995. They are operated by No. 334 squadron on Eindhoven Air Force Base. After they had been bought they were converted to tanker and military transport aircraft. Other systems that were build nto the planes are: the installation of the 'boom'-system and -lightening, adjustment of the fuel-, electric and hydraulic systems to use the boom, a 'Remote Air Refueling Operating' (RARO)-control station with the corresponding systems. The boom operator control station is directly behind the cockpit. 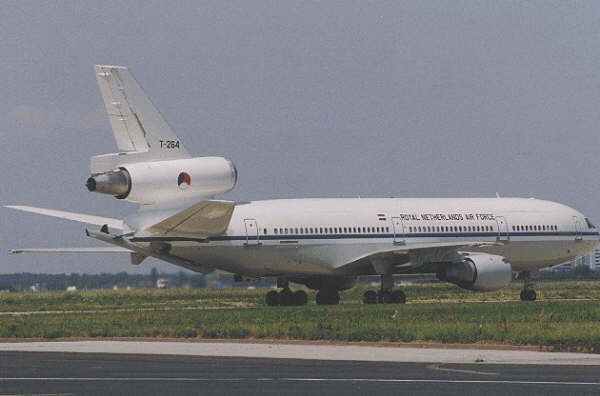 The KDC-10 from the RNLAF can transport cargo and passengers. By only transporting cargo it has a maximum of 65 tons or a combination of 165 passengers and the other half cargo. Usually the RNLAF use this combination. The KDC-10 was send for a period of ??? to Kirzigstan on Manas AFB. From there it was used to refuel Dutch, American and other allied aircraft during Operation Enduring freedom. In November 2013, one KDC-10 flew 29 ton of supplies to the Philippines for the victims of the typhone Haiyan. 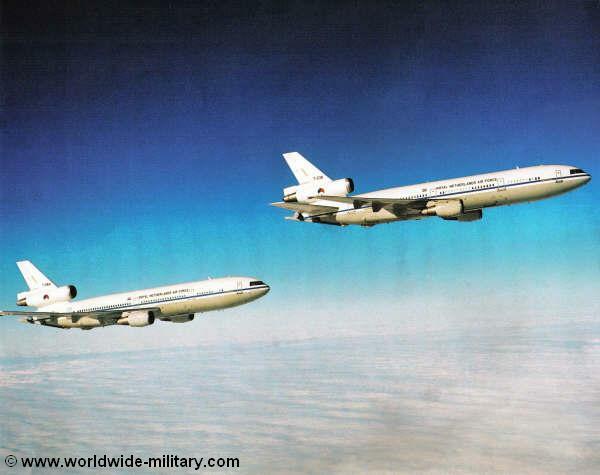 In 2005 Fokker Services (NL) was awarded with a contract to update the avionics from the 2 KDC-10 and DC-10 airplanes from the Royal Netherlands Air Force. The contract value was 30 million dollars. The project contained: design & layout, engineering, installation, integration, tests and certify of state-of-the-art cockpit avionics and accessories. The airplanes were updated with digital cockpits, Link 16 and satellite communications.